B-acute lymphoblastic leukemia (B-ALL) is a neoplasm of precursor cells, that is, lymphoblasts which are committed to the B-cell lineage, involving bone marrow and blood. The lymphoblasts are described as small-to-medium-sized cells with scant cytoplasm, moderately condensed to disperse chromatin with inconspicuous nucleoli. B-ALL mostly presents with bone marrow failure in the form of fatigue, lethargy, persistent fever, bruising or bleeding, and bone and joint pain. Anemia, neutropenia, and thrombocytopenia are common in newly diagnosed cases of ALL. The severity reflects the degree of marrow replacement by leukemic lymphoblasts. ALL is the most common childhood malignancy accounting for 20% of all carcinoma and 70% of all leukemia diagnosed among patients younger than 20 years of age. ALL presenting with normal platelet count is rare. We present a case of B-ALL, who had a normal platelet count on peripheral smear with anemia and leukopenia. 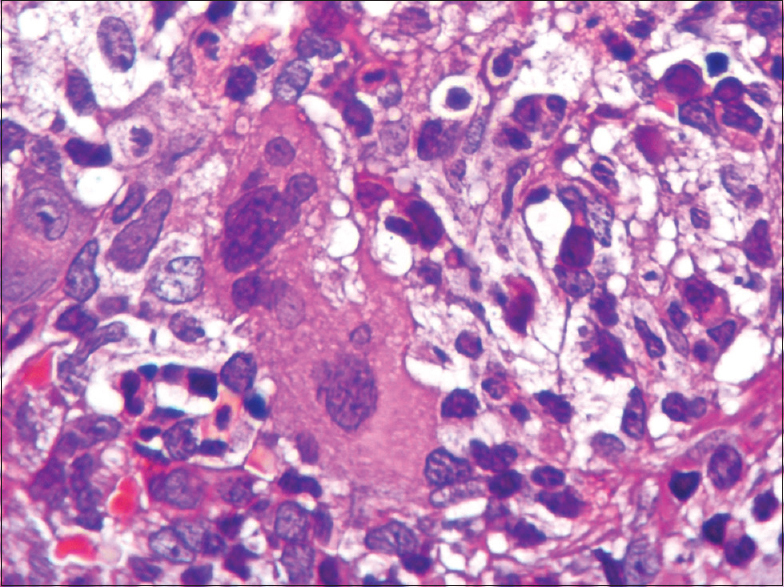 A 15-year-old female presented with a history of high grade, continuous fever for 1-month duration. The patient also complained of generalized weakness, malaise, giddiness, pain in lower limbs, bone pain, and breathlessness on exertion. The patient did not have any significant past medical history or family history. No complaint of bleeding, edema, or joint pain was noted. On examination, she was pale. No rashes, lymphadenopathy, or organomegaly was present. There was no history of blood transfusion. Chest X-ray, electrocardiogram, and urine routine microscopy were normal. Direct Coombs test and indirect Coombs test was negative. No history of tuberculosis (TB)/TB contact was present. Test for HIV and Hepatitis B were negative. A routine hemogram revealed bicytopenia with a hemoglobin level of 6.8 g/dL, red blood cell count of 2.26 million/μL, and a total leukocyte count of 2650 cells/μL. The red blood cells showed mild anisocytosis and were predominantly normocytic, normochromic with few macrocytes, and macrovalocytes. Differential leukocyte count showed 10% blasts, 68% lymphocytes, 20% neutrophils, and 1% each of myelocyte and metamyelocyte. Platelets were adequate with a count of 325 × 103/μL with few giant platelets. The platelet indices, namely mean platelet volume, plateletcrit, and platelet-large cell ratio, were normal. Bone marrow aspirate smears did not show any particle but were cellular with the presence of 65% lymphoblasts [Figure 1]. The blasts were 1.5–2.5 times the size of small mature lymphocytes with high nucleocytoplasmic ratio with the scant amount of blue agranular cytoplasm. The nucleus was round in shape with an irregular nuclear membrane. Few of the nuclei showed clefting and indentation with opened up chromatin and 0–2 inconspicuous nucleoli. The erythroid and myeloid series appeared to be reduced. No megakaryocytes were seen. Therefore, a diagnosis of acute leukemia was made. These blasts were negative for myeloperoxidase. 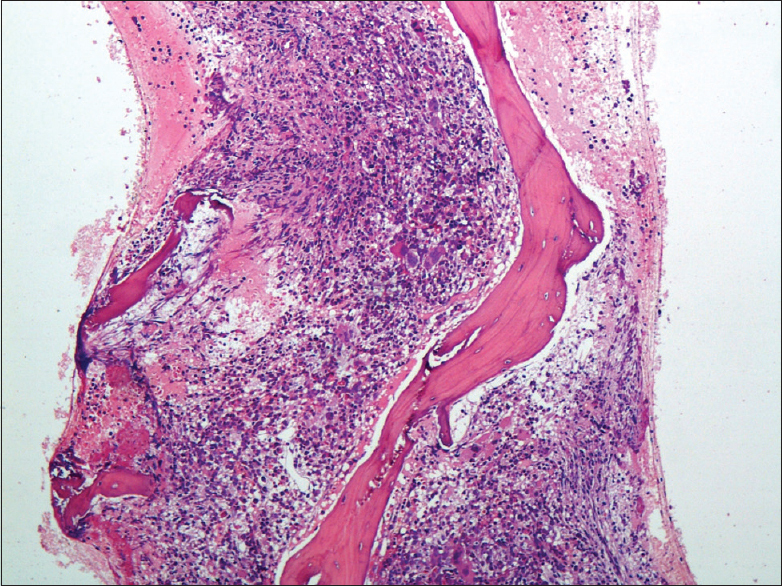 Bone marrow biopsy showed bony trabeculae enclosing hypercellular marrow spaces with suppression of myeloid and erythroid series. The marrow spaces were predominantly occupied by blasts [Figure 2]. These blasts had similar morphology as above. Megakaryocytes were adequate in the biopsy [Figure 3]. 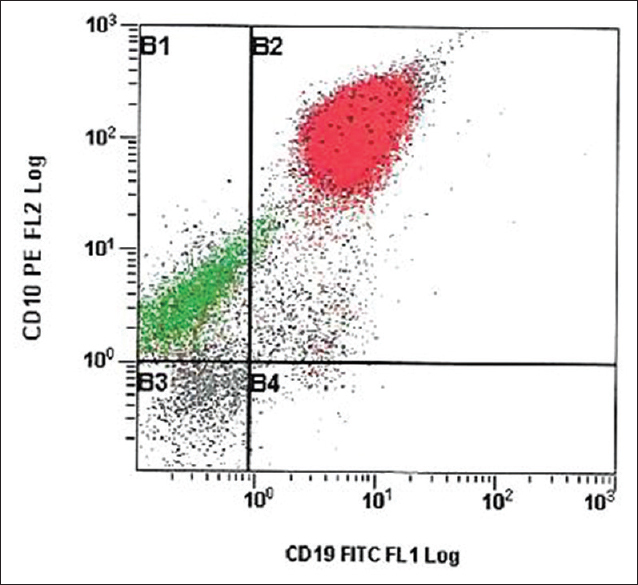 On flow cytometry, these blasts showed bright expression of CD10, moderate expression of CD34, dim expression of CD19, CD79a, HLA DR, and TdT. CD10 and CD19 coexpression were seen in 99.4% blasts [Figure 4]. In addition, blasts were negative for myeloid markers and T-cell markers. A diagnosis of common-ALL-antigen-positive precursor B-cell ALL was reported. The patient is currently receiving induction phase of chemotherapy and is responding well. Patients with ALL often present at the time of diagnosis with pancytopenia or bicytopenia but may sometimes have normal peripheral blood cell counts. The platelet series is the earliest and the most consistently decreased series in ALL cases at the time of diagnosis and even at the relapse phase. Symptoms and signs in ALL are generally consequences of bone marrow failure or due to infiltration of medullary or extramedullary sites by leukemia. Decreased platelet counts are often seen at the time of diagnosis (median: 48–52 × 109/ L), and megakaryocytes are decreased or absent. Occasional patients, principally male, may present with thrombocytosis (>400 × 109/ L). However, Straus et al. reported that children diagnosed with ALL had elevated immature platelet fraction% (median 10%, P < 0.01), suggesting that thrombopoiesis is stimulated despite the virtual absence of bone marrow progenitors. In this case, the patient had 65% blasts in bone marrow causing suppression of the erythroid series but leaving the megakaryocytic lineage unaffected. Despite extensive literature search, not many such cases seem to have been reported. A single study by Hara et al., published in 1990, has reported 36 of 202 children (18%) with ALL to have a platelet count >150 × 109/μL at diagnosis. Hara et al. found this to be related to the male gender, less marked leukocytosis, less severe anemia, less frequent bleeding manifestations, and a lower percentage of bone marrow blasts. Another study by Dewan and Agarwal reported a case of 12-year-old female with ALL and normal platelet count having anemia and leukopenia, no bleeding manifestation and 85% lymphoblasts supporting the present case report. In addition, the study by Hara et al. also showed that ALL patients without thrombocytopenia had a significantly higher probability of continuous complete remission than those with thrombocytopenia. The present case highlights that ALL may present with anemia, and/or leukopenia with a normal platelet count. Hence, the bone marrow examination with flow cytometry is crucial for workup. Swerdlow SH, Campo E, Harris NL, Jaffe ES, Pileri SA, Stein H, et al. WHO Classification of Tumors of Hematopoietic and Lymphoid Tissues. 4th ed. Lyon: IARC; 2008. Raetz EA, Loh ML, O'Brien MM, Whitlock JA. Acute lymphoblastic leukemia in children. In: Greer JP, Arber DA, Glader B, List AF, Means RT, Paraskevas F, et al., editors. Wintrobe's Clinical Hematology. 13th ed. Philadelphia: Lippincott, Williams and Wilkins; 2014. p. 1616-36. Hon Pui C. Acute lymphoblastic leukemia. In: Kaushansky K, Lichtman MA, Beutler E, Kipps TJ, Seligsohn U, Prchal JT, editors. William's Hematology. 8th ed. New York: McGraw Hill; 2010. Dewan K, Agarwal K. Acute lymphoblastic leukemia with normal platelet count. Cancer Transl Med 2015;1:181-2. Blatt J, Penchansky L, Horn M. Thrombocytosis as a presenting feature of acute lymphoblastic leukemia in childhood. Am J Hematol 1989;31:46-9. Strauss G, Vollert C, von Stackelberg A, Weimann A, Gaedicke G, Schulze H, et al. Immature platelet count: A simple parameter for distinguishing thrombocytopenia in pediatric acute lymphocytic leukemia from immune thrombocytopenia. Pediatr Blood Cancer 2011;57:641-7. Hara T, Mizuno Y, Ikuno Y, Okamura J, Nagata M, Ishii E, et al. 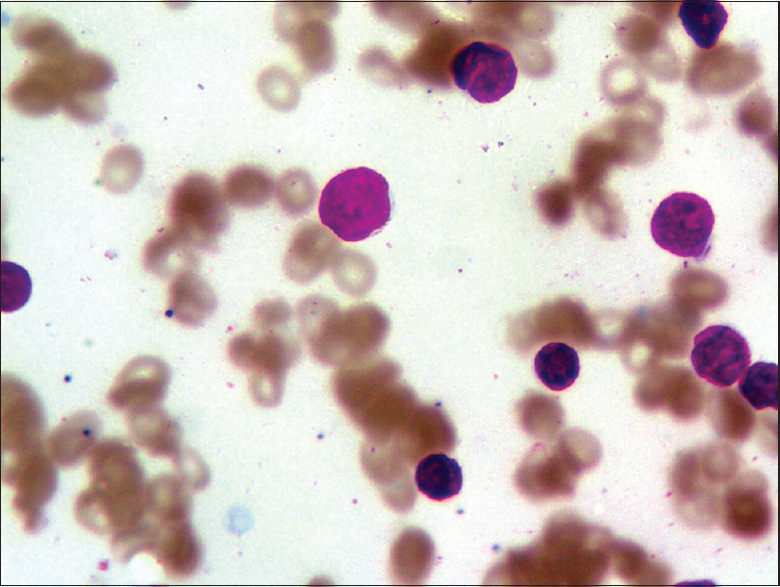 Acute leukemia with normal platelet count at diagnosis. Acta Paediatr Jpn 1990;32:515-8.